Sierra Edd stands by her painting Grandmas Night. The painting took first place in August in the Youth Painting Division at the 2010 Southwestern Association for Indian Arts exhibit in Santa Fe. 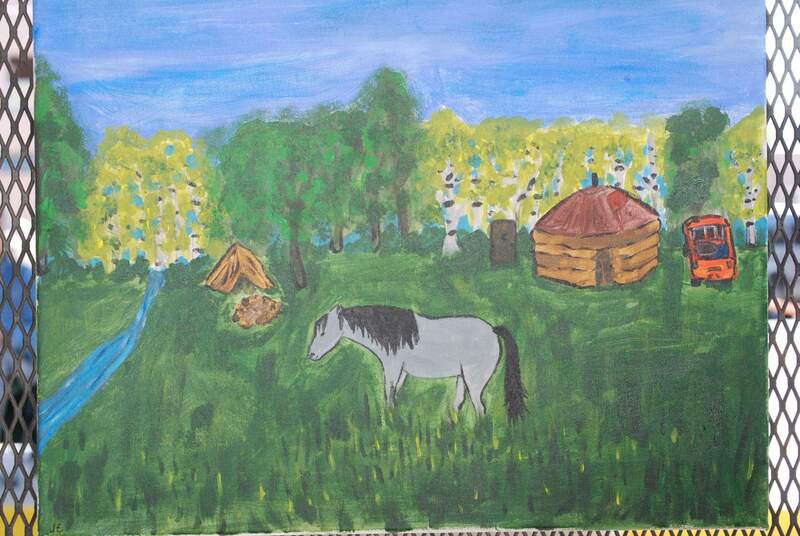 Sierra Edd painted this scene of her grandmothers farm for the 2009 Santa Fe Indian Market exhibit. She paints scenes from everyday life. She stores up ideas for when she has more time. She just won two distinguished awards. She has art collectors waiting for her next pieces. This is not your typical 14-year-old. 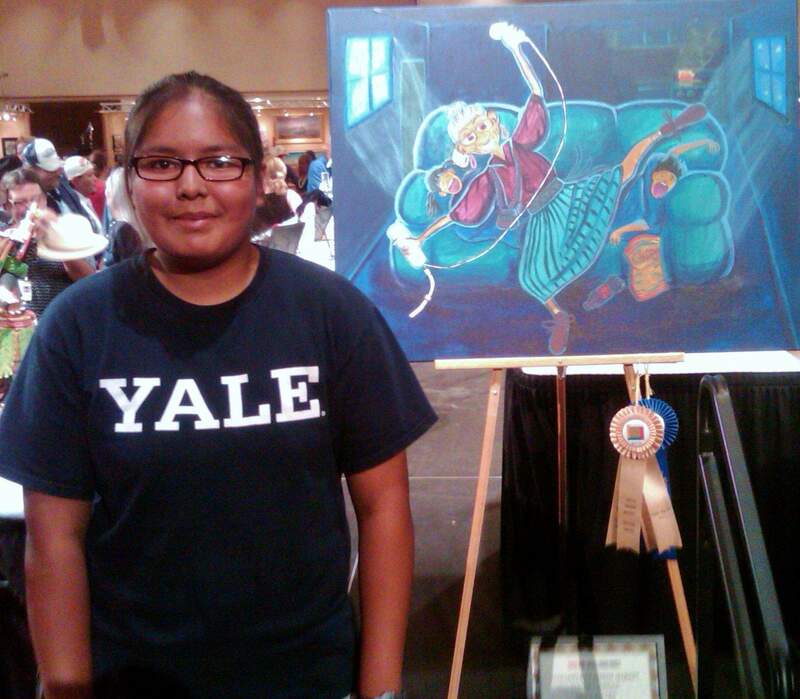 Sierra Edd, a member of the Navajo Nation, took first place in August in the Youth Painting Division at the 2010 Southwestern Association for Indian Arts in Santa Fe, commonly known as the prestigious Santa Fe Indian Market. In addition to winning the top prize in her division, she was awarded the Judges Smile Award, a special recognition given by judges that goes to artwork that is funny. Sierra acknowledges that it was one of her best pieces, yet admits that she entered the contest not expecting a lot. Hers is a family of artists from top to bottom. Her father, Don Edd, is a sculptor, her mother, Esther Belin, is a painter and printmaker, and her three sisters, Ruthie, 16, Chamisa, 10, and Santana, 8, all are painters, too. Even though all sisters enter their pieces under the same youth category, competition and jealousy do not rear their ugly heads in this family. We are just happy that someone got an award, Sierra said. Drawing and participating in the Indian Market since the age of 5, Sierra has no formal training except what tips shes gleaned from her parents. Both parents attended the Institute of American Indian Arts, and her dad taught her the importance and technique of shading. Her mom has been helpful in introducing her to other Native artists, like Shonto Begay, who uses little brush strokes characteristic of Van Goghs style. Begays work highlights the shading technique as he doesnt use the color black. Their early start in the art world attracted quite an audience for Sierra and her sisters. Being among the relatively few young artists with formal representation, buyers started early and keep coming back to check out their artwork, see how it has changed and buy it. Sierra prices her own artwork, and an average piece costs $400. Her profits are deposited into a bank account she uses to buy new art supplies. Her subject matter used to center on landscapes and wildlife but it has changed, matured and now incorporates more concepts of humanism. I used to paint my own thing, like a picture of a unicorn, she said. But perhaps owing to her success at the Indian Market, she now is more aware of her audience and paints scenes that are truer to Native American life. Augusts winning painting, called Grandmas Night, features the theme of technologys generational divide. Sierra believes the older generation is interested in the Internet, cell phones and Wii video games, but they dont know how to work them. They feign disinterest, dismissing the technology as kid stuff, but they are really fascinated. The acrylic painting shows a grandma hogging the Wii while her grandkids sleep on the couch behind her. She first sketched the design out on a small, gridded canvas. Then she translated the image into enlarged proportions. I didnt want to ruin it by losing any of the detail, she said. Sierra wants to expand on this theme, and she has an idea for a future painting featuring a grandfather and young kid playing the X-Box. Behind them stands the mother, tapping her foot in disapproval, yet the grandfather and kid are so interested in the game they dont notice her disdain. But that painting is stored in her brain for now as her focus is on school. She hopes to find some quality time during breaks in the school year to paint, but in the meantime shell have another chance for commercial success through Durango High Schools logo contest. Demons in snowsuits may not be her subject of choice, but such is the life of a working artist.